Casino Share is licensed in Kahnawake and operated by the team from Play Share Group, which were behind the inventive Poker Share concept. 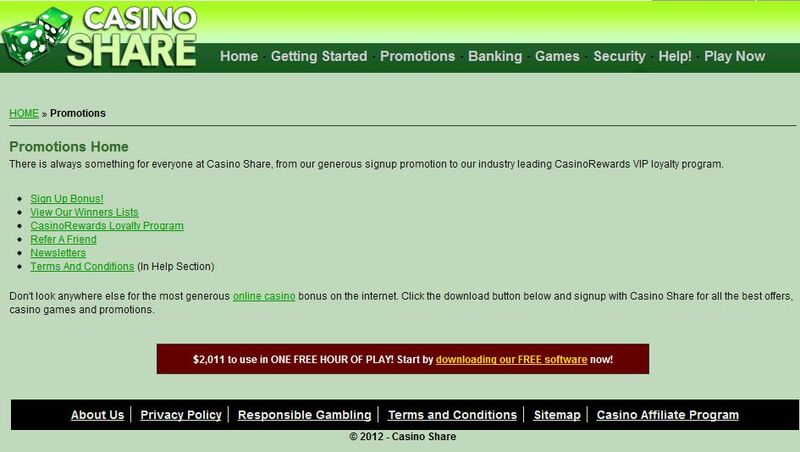 Being powered by the successful Microgaming software, Casino Share is able to offer download and flash versions of their online casino games. Languages supported whilst playing at Casino Share are English, Italian, German, French and Japanese, you will also be able to wager in a variety of currencies such as: US Dollar, Pound Sterling and Euro. Unfortunately for all those online casino players in America, you should know that they do not accept US players. Not only does Casino Share strive to offer a wide range of new and exciting online casino games in a safe and secure environment but they also have a friendly customer service department which is available at anytime via chat, email or toll free phone numbers. $ € £2010 Welcome bonus plus Casino Share are giving new casino players one hour free with the ability to keep the winnings ($20 minimum if you do not win anything). Players will also receive monthly reload bonuses and chances to win prizes such as Nintendo Wii. Casino Share has daily lotteries which are FREE to enter, monthly slots tournaments on new games plus a weekly slots bonus. This online casino has an original loyalty program which offers excellent reward options, like rewards for every wager made and double points on Fridays. The following options are all accepted at Casino Share; deposit using Neteller, credit cards, Citadel, Click2Pay and Withdraw with the previous mentioned deposit methods including Wire Transfer, Debit cards and checks. Casino Share is one of the new and largest Microgaming powered casinos , offering over 300 casino games, which one of the most currently offered by an online Microgaming casino. This highly respected online casino caters equally well for players in Europe, Asia and the UK. Players at Casino Share are able to access features like Auto play on video slots and built in blackjack strategy cards. Players will not only have a vast game choice, but they will have no concerns with player security or platform stability. Casino Share have their payout reports audited by an international firm and all players bets are recorded and able to be view and analysed by that specific player. Players will be spoilt for selection when it comes to games choice at Casino Share. 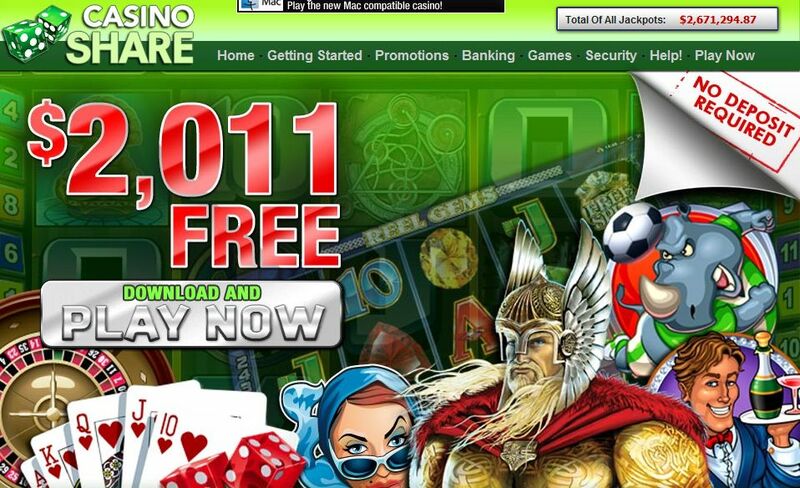 This popular online casino offers Four Roulette games which include American and European, Craps and more. Players can try any of the 15 Blackjack games or if you have time check out the 180+ slot games with a new slot game being introduced each month. Casino Share has 19 Progressive Jackpots, Video Poker, 8 100 hand games and Full pay on all Casino Share’s 6/9 Jacks or Better game varieties. is there anywhere i can play online slots for money?